Ted Turner, Henry Ford and Richard Branson. 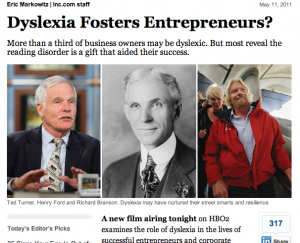 Dyslexia may have nurtured their street smarts and resilience. 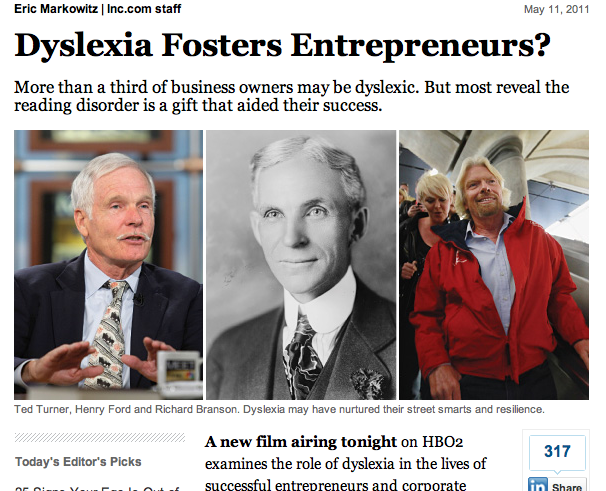 A new film airing tonight on HBO2 examines the role of dyslexia in the lives of successful entrepreneurs and corporate leaders around the world. The film, Journey into Dyslexia, directed by Alan and Susan Raymond, presents several prominent dyslexic adults including Ben Foss, inventor of the Intel Reader; Steve Walker, New England Wood Pellet founder and CEO; and Carol Greider, Ph.D., a 2009 Nobel Laureate in Physiology and Medicine. Eric Markowitz reports on start-ups, entrepreneurs, and issues that affect small businesses. Previously, he worked at Vanity Fair. He lives in New York City.